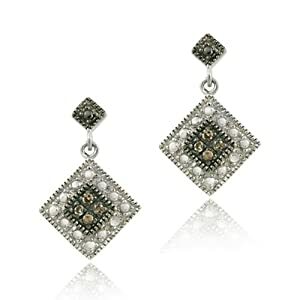 Champagne diamond earrings capture this spirit of elegance, femininity, celebration, and audacity perfectly! What is a champagne diamond? A Champagne Diamond is one of the most beautiful naturally-colored gems on earth. Like all diamonds, these stones vary in value, with some being priceless. Champagne diamonds are available in a variety of hues that range from light straw, cognac, blue, brown to pink and purple. 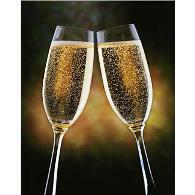 Just like pure colorless diamonds, champagnes are formed below the earth’s surface with extreme pressure and heat. The only difference is that elements such as boron, nitrogen and hydrogen interact with carbon during the formation process. This interaction is what gives champagne diamonds their color. Since 1979, champagne diamonds are mainly found in the Argyle Diamond Mine in Western Australia. It is the largest diamond-producing mine in the world but only generates 5% gem-quality stones. The traditional Aboriginal owners of Western Australia believe that different colors in Argyle’s champagne diamonds are from the parts of a native fish known as the barramundi. According to the Dreamtime explanation, a barramundi died and was turned into white stone, but the barramundi fat (a great delicacy) became the region's pink diamonds, and the barramundi's organs became the various brown and yellow gems. 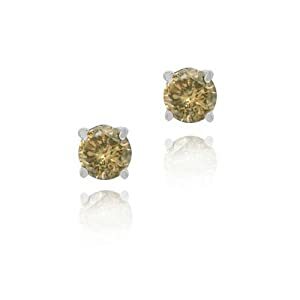 Champagne diamonds are categorized as “fancy” gems. They may not be as expensive as pure colorless diamonds but they are extremely rare and every bit as elegant. As the Argyle Mine in Australia is the top producer of champagne diamonds, it is the Argyle color grading scale has been adopted by jewelers worldwide to determine value. As a rule, champagne diamonds with deeper and darker hues are valued higher than those with lighter ones. Just as "white" diamonds and black diamonds are surrounded by their own mystique, and have their legendary and iconic jewels, several champagne diamonds are also famous. 4. The Golden Jubilee or the Fire Rose cut diamond (545.67 carats, which was presented to the King of Thailand in 1997). See the Golden Jubliee - a famous champagne diamond too big for earrings! 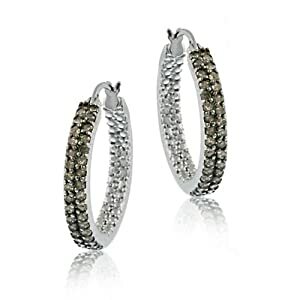 Champagne diamond earrings are perfect for individuals who love warm, versatile and exotic pieces. These precious colored stones best complement neutral gems such as pearls or white diamonds, and are usually set in silver, white gold, platinum or rose and yellow gold. Champagne diamonds can be bought at excellent discounts from reputable online dealers. For the best deals and quality, remember what qualities matter most in these particular gems. Today they are available at a huge range of price points, allowing everyone the opportunity to get chic and exotic with champagne diamonds. Champagnes are considered the haute couture of naturally colored diamond jewelry. This is reflected in how many celebrities are not appearing in champagne diamond earrings. A few of the many celebrities who have expressed their love for champagne diamond jewelry are as follows – J. Lo completes her red carpet look with champagne diamonds and other stars like Cate Blanchett, Jessica Simpson, Hilary Swank, Cameron Diaz and singer Natasha Bedingfield have been spotted wearing different pieces of champagne diamonds to the Oscars, the VMAs and other A-list events. Make a statement just like your favorite hot celebrities. Be noticed and turn heads by choosing to accessorize with alluring champagne diamonds.